Nevada homeowners gained an average of $29,400 in home equity in 2018 - which ranked #1 of all 50 states. The average USA homeowner gained $9,700 in home equity in 2018 per CoreLogic a leading global property information, analytics and data-enabled solutions provider. The report shows that U.S. homeowners with mortgages (which account for roughly 63 percent of all properties) have seen their equity increase by 8.1 percent year over year. While home equity grew in almost every state in the nation, western states experienced the most significant annual increases. 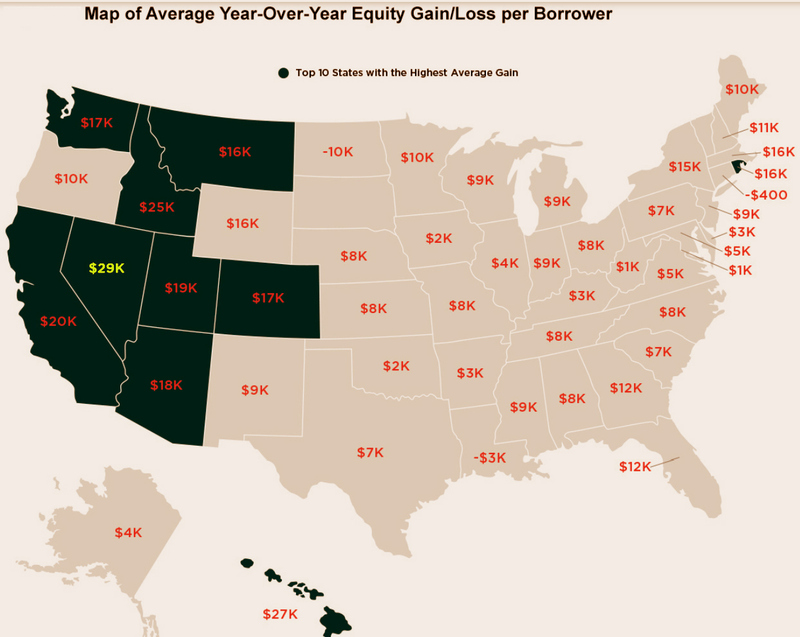 Nevada homeowners gained an average of $29,400 in home equity - which ranked #1 of all 50 states. "Our forecast for the CoreLogic Home Price Index predicts there will be a 4.5 percent increase in our national index from December 2018 to the end of 2019," said Dr. Frank Nothaft, chief economist for CoreLogic. "As home prices rise, significantly more people are choosing to remodel, repair or upgrade their existing homes. The increase in home equity over the past several years provides homeowners with the means to finance home remodels and repairs," said Frank Martell, president and CEO of CoreLogic. "With rates still ultra-low by historical standards, home-equity loans provide a low-cost method to finance home-improvement spending. These expenditures are expected to rise 5 percent in 2019." Methodology: The amount of equity for each property is determined by comparing the estimated current value of the property against the mortgage debt outstanding (MDO). If the estimated value is greater than the MDO, then the property is determined to be in a positive equity position. CoreLogic data includes more than 50 million properties with a mortgage, which accounts for more than 95 percent of all mortgages in the U.S. CoreLogic uses public record data as the source of the MDO, which includes both first-mortgage liens and second liens, and is adjusted for amortization and home equity utilization in order to capture the true level of MDO for each property. The calculations are not based on sampling, but rather on the full data set to avoid potential adverse selection due to sampling. CoreLogic (NYSE: CLGX) is a leading global property information, analytics and data-enabled solutions provider. The company's combined data from public, contributory and proprietary sources includes over 4.5 billion records spanning more than 50 years, providing detailed coverage of property, mortgages and other encumbrances, consumer credit, tenancy, location, hazard risk and related performance information. The markets CoreLogic serves include real estate and mortgage finance, insurance, capital markets, and the public sector.